So, I've been doing some speed typing tests on the keyone and the LE. I wanted to see which one I could type faster on. I've taken into account that I've been using the keyoneblack for 15 months. I've been using an app for mobiles calle Typing Speed v1.6 , which is an Indian app with a version in English, but with quite a few grammar errors in English. 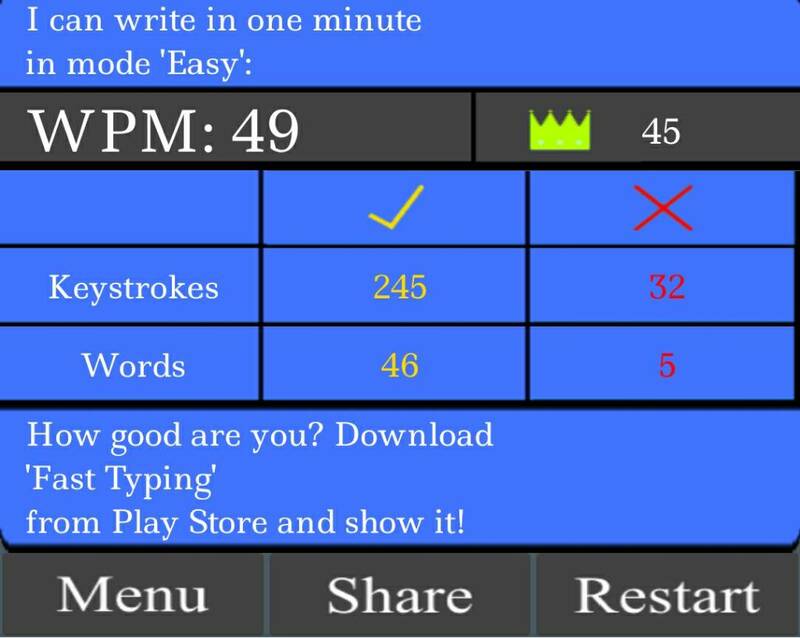 Although I can now touch type on my laptop between 45-50WPM, on the mobile PKBs my best is 30 WPM. After a couple of days I'm averaging around 23-24 WPM on both keyboards. I have to say that the texts have MANY very long words on this app, and if anyone knows of a better typing app for mobiles I'd appreciate it. On the LE compared to the keyone, the keys are easier to press down, although accuracy isn't better yet. The almost deal-breaker is that the space bar is raised higher than the other keys, it's the same height on the keyone. The design and size seems the same. This means that when I hit the 'V' key I sometimes also hit the space bar and jump a word. Has anyone noticed this? I don't belive pkb is faster that virtual, but more accuracy. When you type with pkb your using touch feeling wich makes me writte almost without see at the pkb and keep focus on text. In case of vkb you are always looking at your keyboard and also you make lot of mistakes during texting only saved by vkb autocorrect. I'll check that apps you say about texting speed but it doesn't take away the dream. Meh, I know I prefer the LE's keyboard by far, the weight of the device and easier to press keys means less tiring typing sessions. I'm on my Slate LE, and I'm not getting any other device (aside from Atomic) until the next gen KEY series. This thing is awesome and super reliable, the battery life is much better than I thought for a 3000mAh cell. Haha, same for me, btw you use slate over atomic?You got it don't u? Ok, that's Fast Typing , right? Ive just downloaded it. On my first Go just now I scored 28 in Easy mode. I'll keep practising! I thought I am the only one (but almost everyone says how fast LE is which I do not care :D). At first, I was pretty angry about higher space, almost returned LE because of this. You will get used to it probably, I can say that I press space instead of V or B only 1-2 times per day. But still, very weird decision.. Designer has probably very small fingers..
Is there a Spanish typing app for mobiles? ¿Existe una app para practicar La mecanografía en el móvil en castellano? I can't activate my Blackberry keyboard. Am I missing something? That is correct, you can't turn off it if it's the only keyboard app installed. I had my Slate for a bit over 2 months now. Don't have the Atomic yet but looking to buy it in the near future. This may sound silly, but what is Slate and Atomic? Keeping it on keyboard topic, the only one with matching frets is the Atomic red. It makes the colour of the phone more obvious of course. Whichn is why I bought it. Still practising on my new KEY² I got last night. Everything would have been fixed by auto-correct. Right but the Slate is dark anyways so I consider it a normal color choice. Slap anything other than clear case on the champagne and no one could ever know that the device isn't just a standard black. Just yesterday? Have you also got an LE. That's a good typing speed. No LE. I was very happy with my Silver KEYᵒⁿᵉ, but curiosity got the best of me. Elevated space bar doesn't really impact my typing because I use thumb nails. Trimmed to protrude slightly. Far more precise than thumb flesh. Faster too. For me, at least. My profession demands far too many unique names, nomenclatures, and acronyms for effective auto-anything. Imo. Typing rate apps can be great indicators and good practice. Might possibly even evolve into a "smartphone olympics"?? Lol. My complaint about these apps is that, unlike historically typical type writer use case, smartphones aren't intended as "copy" machines. Smartphones are real time COMMUNICATIONS appliances. Where concepts, words, and sentences originate cognitively. Thought to thumb. Quite different than eye to thumb. Imo. Measured in terms of daily productivity, I'm finding LE significantly improved over K1. Not quite 50% of 9900 but best currently available. Imo. Since K series, and ANYthing "modern", seems ordained to be ridiculously oversized, I've found the belt clip on the back of Seidio BBKNAS provides a beneficial grasp point while typing... fwiw. Have you used the LE at least? I would like your input on the pros and cons and differences you like/notsomuchlike about the Key2 vs LE. Next time I'm in Best Buy, I'll give it a try.